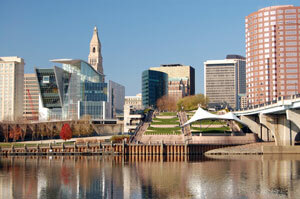 Hartford, also known as the “Insurance Capital of the World,” is the capital of Connecticut and is home to over 100,000 people. There are a variety of neighborhoods throughout Hartford allowing local advertisers to target their audience with specified out-of-home advertising and billboards. Some notable neighborhoods prime for advertising are Downtown, Frog Hollow, and Asylum Hill. Points of interest in Hartford are also effective advertising opportunities. The Bushnell Center for the Performing Arts and the Connecticut Science Center are just two examples. The major highways that service the city also offer outdoor advertising and billboard possibilities. Billboards on I-84 or I-91 would generate high traffic exposure for your business. Zip Codes: 06101, 06102, 06103, 06104, 06105, 06106, 06112, 06114, 06115, 06120, 06123, 06126, 06132, 06134, 06140, 06141, 06142, 06143, 06144, 06145, 06146, 06147, 06150, 06151, 06152, 06153, 06154, 06155, 06156, 06160, 06161, 06167, 06176, 06180, 06183, 06199.